Family, rest, hot food -- and a really cool pair of shades. That's what a miner needs after being trapped underground for more than two months. Eyewear and sporting equipment maker Oakley is handling that last part: It has provided high-performance wraparound sunglasses to the 33 Chilean mine workers who were being pulled to the surface Wednesday after 69 days stuck almost a half-mile underground. 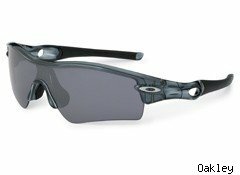 Oakley, a Luxottica (LUX) subsidiary, donated Radar sunglasses with black iridium lenses (pictured), a variety that are usually used for high-performance sports and are designed to minimize ultraviolet light, the Associated Press reported. Scientists say the miners risk retina damage because of the sudden change in lighting after so much time underground. The miners, who are being lifted up to the surface one by one in a rescue vessel, were trapped on Aug. 5 by a collapse of 700,000 tons of rock. As of early Wednesday afternoon, more than half of the workers had been pulled to the surface through a 2,000-foot-long rescue shaft.